This stunning, exclusive holiday villa is only a five-minute walk from the beach of Noordwijk and the wonderful Koningin Astrid boulevard. The house has a very beautiful, atmospheric, and functional interior. In the living room there are 2 large sofas surrounding a fireplace. There is a lovely piano and a large dining table for long dinners. The kitchen is decorated and equipped for true chefs, where you can prepare your delicious meals. The house has 4 bedrooms and 3 bathrooms, all in a nice, fresh beach style, with beautiful ornaments and atmospheric prints, shells, and pictures. There is a very spacious ground floor, with a second TV and DVD/Playstation, table football and a shuffleboard, a crafts table for the small children and beanbags for everyone. There is a beautiful dune garden surrounding the house, where children can run and play and there is sun during the entire day. However, there are also intimate, shady spots for having a glass of wine at the end of the day. We hope to welcome you in this special house. 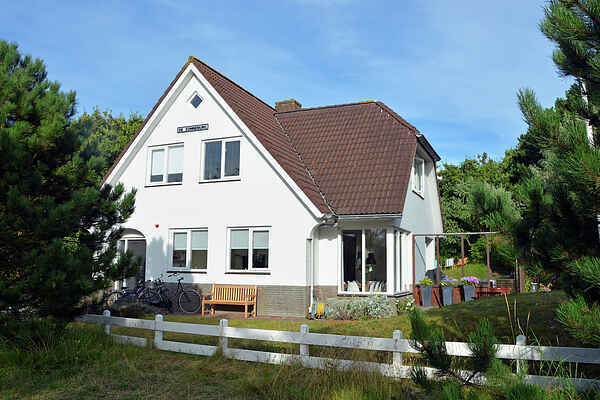 In Noordwijk aan Zee you can enjoy the beach, sea, and dunes: you can go swimming, hiking, golfing, and cycling. Deer, foxes, rabbits, and birds accompany you during your holiday. Additionally, large cities like Amsterdam, The Hague, and Leiden are only a 30-minute drive away. Please note: The maximum allowed number of persons in this house is 10, the maximum allowed number of adults is 6 (+ 4 children).